We have a pretty dim view of beings of perfect order in modern pop culture. We usually see perfect order as the destruction of free will, and the transformation of human beings into soulless automatons. Such avatars of order often have grand designs to bring order to all of existence, ending self-determination for all creatures in an autocratic crusade. Modrons... aren't that. They're cute and quirky robotic bureaucrats that defend their clockwork plane of Mechanus from the forces of chaos, and occasionally frustrate less orderly-minded creatures (like humans!) with their stodgy ways. Fanatical autocrats they are not. 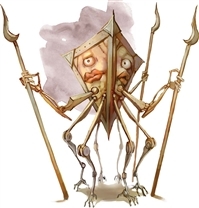 Yet sometimes, even these funny, lawful neutral, polygonal beings wind up in conflict with adventurers. Fifteen distinct types of modrons exist in the Multiverse: five types of base modrons and ten types of modron hierarchs. All of these modrons exist within a strict hierarchy enforced by a simple cosmic principle: a modron can only communicate with and comprehend the actions of modrons of its own type, those directly beneath it, and those directly above it. The actions modrons beyond this limited scope are either too simplistic or too advanced for them to comprehend. Thus, each step of the modron hierarchy is required to maintain the perfect order of modron society. Modrons are utterly without ego. They have no sense of self—save for their ruler, Primus, the One and the Prime—and act in simple and perfect concordance to the will of the Prime. There is no “I” in the Modron language, simply the great understanding of “We,” the Modrons of Mechanus. Modrons have no names, save for those modrons who are mysteriously and traumatically removed from the greater “We” of modron society. These rogue modrons develop a sense of self and may go on to live fulfilling and individualistic lives of their own. Only base modrons are described in the Monster Manual. These modrons are, for the most part, incapable of rational thought. Monodrones are literally single-minded, capable only of performing a single simple task at once, commanded to them by their duodrone superiors. In combat, these basic minions are exceedingly simple to run because they can only focus on a single objective. Unless a particularly clever duodrone gives it a tactical order, monodrones will either heedlessly attack the player characters, trying to overwhelm and distract them with their sheer numbers. Since monodrones can fly, they are also used to transport their superiors. Duodrones, tridrones, and pentadrones are all incapable of flight, and sometimes need to be “air dropped” to other locations. During the Great Modron March, in which a massive scouting party of modrons travels from the plane of Mechanus and performs a full circuit of the Multiverse, monodrones use their wings to help other marching modrons fjord impassable gaps, such as rivers of flame in the Nine Hells or the void between floating cubes in Acheron. Duodrones supervise the monodrones and can keep two tasks in their mechanical minds at once. This allows it some degree of reactivity. According to the Planescape Campaign Setting (1994), “If ordered to attack, for example, they will do so until the enemy slain and then seek out a new enemy, rather than attacking each other.” This ability to react in tense situations makes them capable soldiers, but they still lack true creativity or self-determination. A duodrone soldier typically commands a unit of twelve monodrones. Tridrones are battalion leaders of the armies of Mechanus, and use their authority to command duodrones, who in turn pass down orders to monodrones. While their individual attacks are quite weak, tridrones can at least make three attacks per turn. Tridrones’ complex minds allow them to perform multiple simple tasks at once. Thus, their quadrone commanders can deliver them nuanced orders that a tridrone can interpret and split up into smaller tasks, delegating these tasks to duodrones and monodrones as necessary. Tridrones possess limited creativity, and can craft simple plans without receiving orders from a quadrone. Quadrones are highly advanced worker modrons. They have the ability to fly and make four shortbow attacks each turn. In second edition Advanced Dungeons & Dragons, they possessed sensory organs on all six sides of their cubic bodies, making them incapable of being surprised. You may wish to carry this rule over into your fifth edition D&D game. The advanced quadrone mind allows it to “report actions and observations, make plans, react to unexpected occurrences, and act to remedy them” (Planescape Campaign Setting). These “field officers” use their remarkable power to both command tridrones on the battlefield and enact their own plans. Finally, the highest ranking base modron is the star-shaped pentadrone. These supremely advanced modrons serve as law enforcement for their orderly society—largely stopping disorderly activity by visitors from other planes, as a modron would never break the laws of its society—and pass down the rules and commands of the modron hierarchs to other basic modrons. Since quadrones are capable of creating plans of their own, pentadrones rarely take direct command of modron military units. Instead, a unit of twelve pentadrones serve as elite protectors of their battalion’s headquarters. Pentadrones are equipped with potent paralyzing gas attack, which it uses in conjunction with its whopping five arm attacks. In addition to the base modrons, there are superior modrons known as Modron Hierarchs. 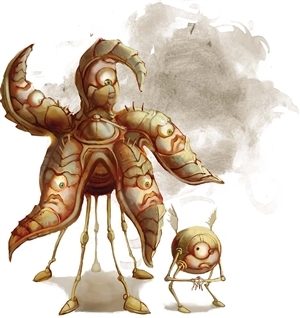 While their stats have been detailed in other editions of Dungeons & Dragons, the modron hierarchs do not appear in Monster Manual—or any other official book of monsters for fifth edition, even Mordenkainen’s Tome of Foes. It seems likely that, if the hierarchs are ever detailed in fifth edition, they’ll appear in an official Planescape release. Hexton (36 units): Command one of the 36 modron armies. Just as with other modrons, whenever a modron hierarch is killed, a modron of immediately lower rank is transformed to replace it, and a modron beneath that is transformed to replace it… echoing down the entire hierarchy until a freshly minted monodrone is spawned within the realm of Regulus. Primus resides within the Great Modron Cathedral at the heart of Regulus, which exists upon a great gear on the plane of Mechanus. While within his domain, Primus is essentially a deity, for there he is connected to the Infinity Web, a matrix of “waxy strands” which allows Primus to see through the eyes of all other modrons, allowing Primus to be an omniscient being… at least wherever his underlings serve. The One and the Prime never leaves the Great Modron Cathedral, but it could be assumed that if he ever were to leave, he would “merely” possess the power of the greatest modron in existence. But Primus can be killed, even within the Great Modron Cathedral—and indeed he has been on at least one occasion. Under normal circumstances, Primus’s death would simply cause one of the four secondi modrons to be promoted to Primus (causing a chain reaction of promotion that would echo through the entire modron hierarchy until finally concluding with a single monodrone trotting briskly out the doors of the Great Modron Cathedral). Of course, the death of the god of all modrons could never occur under “normal circumstances.” Indeed, the only recorded death of Primus caused the events of The Great Modron March, in which a hostile and mysterious entity—no spoilers, ask in the comments for more info if interested—assumed the role of Primus for a time and set off the Great Modron March two centuries early. Unless you decide to create your own stats for modron hierarchs (and they are very powerful creatures indeed), the only stats you have available to use against your players are the base modrons. Nevertheless, the organization of modron armies means that even facing a tridrone is a daunting task. In an undamaged and perfectly equipped modron army, a tridrone is served by 12 duodrones, each of which is similarly served by 12 monodrones. An encounter with one tridrone, 12 duodrones, and 144 monodrones far exceeds the CR ½ estimate for a single tridrone… not to mention that it’s a bookkeeping nightmare. Wounded modron units could easily be made up of fewer combatants. Generally speaking, whenever a modron of rank is killed, a random modron of immediately inferior rank somewhere in the Multiverse is instantly promoted to replace it. During the Great Modron March, however, whenever a modron is destroyed, another modron of immediately inferior rank within the March is instantly promoted, allowing the dwindling numbers of the March to eventually be composed of superior base modrons. Perhaps if your players are forced into combat with modrons, they were separated from the Rogue March that stomped unexpectedly through the Multiverse. Now, scattered and confused, they are attempting to return to the march with only a tattered band of tridrones, and duodrones, led by a small handful of quadrones. This, at least, keeps the numbers down. Since most base modrons are reliant upon orders from their direct superiors, be sure to show your players how disrupting the chain of command affects tactics. Since monodrones can barely comprehend the existence of tridrones, all adventurers have to do in order to throw all monodrones in a single unit into chaos is to eliminate their immediate superiors: the duodrones. Monodrones can only follow a single order, so if their duodrone commanders are destroyed, they follow the last order they were given, even to their own destruction. Other than this fascinating personality quirk, modrons are fairly simple creatures to run as a Dungeon Master. Other than the pentadrone’s paralyzing gas attack, the other base modrons have a very simple kit of melee and ranged attacks (and occasionally flight, though note that a monodrone simply can’t fight and fly at once, since that would require following two orders at once). Of course, modrons and their quirky behavior are very specific to the D&D Multiverse—and the Planescape setting from which it originated. But these days, modrons are in the Monster Manual itself! 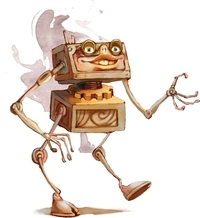 If you want to change how modrons work in your campaign, you are empowered to create all new lore and behaviors for these funny little mechanical critters. Don’t worry—Primus won’t mind. 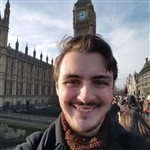 James Haeck is the lead writer for D&D Beyond, the co-author of Waterdeep: Dragon Heist and the Critical Role Tal'Dorei Campaign Setting, the DM of Worlds Apart, and a freelance writer for Wizards of the Coast, the D&D Adventurers League, and Kobold Press. He lives in Seattle, Washington with his partner Hannah and his two felines of absolute chaos, Mei and Marzipan. You can usually find him wasting time on Twitter at @jamesjhaeck. I think the modrons are really interesting to use as guards. Even the newest edition to the modrons, I don't know the name of the creature but i know that it could send creature to the plane of Primus for law. Though I would like to see more in the future. The concept of the tiers of the modrons is a little confusing, I don't get how one monodrone can instantly turn into a duodrone, like does the transformation part act like poly morph, where the monodrone can choose if it upgrades or does it forcefully transformed. For me I think the forcefully transformed is most likely possible but after transformation does it have the choice to also degrade back into a monodrone? I love modrons and I think that they are a really good concept. I can't wait to use this information next time I create an adventure with them in it. Seems like you could use swarm rules for the monodrones to make life at least a little easier. does the transformation part act like poly morph, where the monodrone can choose if it upgrades or does it forcefully transformed. For me I think the forcefully transformed is most likely possible but after transformation does it have the choice to also degrade back into a monodrone? 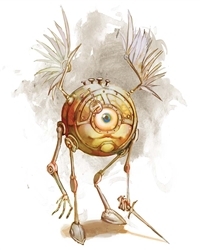 Judging by their entry in the Monster Manual, the concept of individual choice does not exist in the mind of a Modron. As for which of them is chosen, I'd hazard a guess that it was automated. Overall, I'd say it's neither forceful or by choice, the promotion is simply a part of their existence. Of course, this is just my interpretation, and you can choose how to interpret it in your own game - whatever best fits your story! I love these fellas, they are this mix of awkward and hilarious that makes me picture them as Sheldon Cooper but with C3PO's voice and colour scheme. They are a lot of fun to play around with and make for excellent minions for a lawful wizard or a gold dragon. Really enjoyed this article! How about getting a modron “upgraded” mid-fight? I've got to ask. Who was the mysterious entity that killed a Primus and set off the great march early? Another piece of advice I have heard is to treat all modrons as having rolled 10's on their initiative, making the modrons feel clunky and mechanical. Oh boy... that's actually so damn brilliant and fitting I'm definitely gonna use that :D It even corresponds with the clockwork amulet (the one that lets you substitute a d20 roll with a 10) extremely well. In canon, Primus got killed before the start of the AD&D adventure-line "The Great Modron March", when Orcus (in his undead incarnation as Tenebrous) snuck into Mechanus and killed him, then stole his identity and set the March off early to look for his precious Wand so he could use it to restore himself to life. Though Orcus canonically got his Wand back, revived himself and left, allowing the Modrons to generate a new Primus, Dragon Magazine #341 states that the Primus that Tenebrous killed ended up becoming a Vestige. 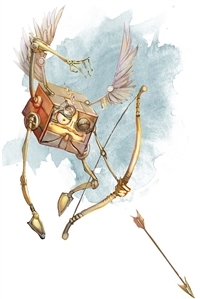 One of my favorite optional rules from years back with Planescape was that, when creating a modron PC, you rolled initiative during character creation. Being tied to absolute Law meant you always went on that roll ... for your character's whole life. (DM) As it approaches it stops for a second, then grows a million more swords and stuff. (DM) And within a second you are all dead. 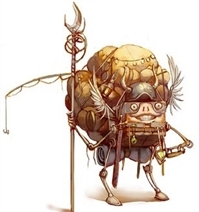 Im homebrewing Modrons as a playable race in my Planescape campaign. Great article. I won't take credit for the idea, but I absolutely love it. It wasn't said specifically in the context of Modrons, but constructs in general, noting how having a sudden burst of action in the center of initiative helped sell the fact that these were machines working perfectly together. Yet it definitely holds true with these lovable things. That's hilarious. Awesome way to stay in character. From my understanding they do not have a choice in it and the Modron in question is chosen by the mathematical calculations of the Primus that makes up the essence of each Modron. I have also not heard of any lore pertaining to an instance where a Modron of any kind has been demoted, willingly or otherwise. In my homebrew campaign, Modrones are being torn away from Mechanus through a portal to be used as colonial labor. It was very entertaining to watch my players track down and deal with one who was "fluent in over 6000 forms of lifting, stacking, and folding." (Yes, lots of Star Wars references are being used). The poor local reindeer rancher - all his firewood was neatly compacted and stacked... but so were his reindeer. If you were unlucky enough to come across an entire army led by one of the Hextons (Which I assume break the rule of the "one up, one down" Hierarchy mechanic, since the Hierarchs in between Hextons and Decatons all have different jobs that don't involve running armies) You'd also be facing 12 Pentadrones, 144 Quadrones, 1728 Tridrones, 20,736 Duodrones, and a whopping 248,832 Monodrones. If the numbers of Pentadrones are based on the number of Decatons and not Hextons, this number would be much bigger, so let's pretend that's not the case. But why stop there? You have a burning desire to wipe out all the Modrons, for some reason, you evil sonofa... You want to fight the whole lot of them! With 36 Hextons all leading their own armies... You'd have Modrons as far as the eye can see and then some. Here we go: That's 432 Pentadrones, 5184 Quadrones, 62,208 Tridrones, 746,496 Duodrones, and, count 'em, 8,957,952 Monodrones. You must also remember the "instant promotion" mechanic, meaning that even if you kill a Pentadrone, the immediate replacement up the entire chain means you've essentially only killed a Monodrone... which would be replaced with a new one... which probably joins the ranks faster than you can kill the rest of the army. Does D&D Have rules for nuclear warfare? If not then I wouldn't advise this without a trebuchet or two, launching wizards that are also launching Meteor Swarms. Since I've already come this far, I went ahead and calculated the entire population of Modrons in existence at all times. :) At 36 armies that's 9,772,272 total "fighting class" Modrons from Pentadrones down. Add in the Hierarchs which total at 385 including The Prime, and you have 9,772,657, nearly 10 Million total Modron alive and kicking at any given time. The Great Modron March must have been spectacular, indeed. Who else, Orcus. I don't remember what he wanted. But it was Orcus. Homebrewed the modrons hierarchs: Decatons, Nonatons, Octons, Septons, Hextons, Quintons (the formatting on the quintons messed up a bit, but should be discernible), Quartons, Tertians, Secondi, and Primus itself! Edit: Sorry, there is no picture for the decaton and nonaton.